The Ancient Ozarks Natural History Museum is one of the most fascinating Branson attractions which features rich ancient history of the Ozarks. This newly expanded museum gives you the opportunity to see face-to-face with prehistoric creature and astounding galleries showcasing the American West and Civil War. Inside the museum, you will find carbon-dated skeletons of ancient-Missouri creatures, true-to-life dioramas of animals that once roamed the Ozarks. There are also rooms that feature Native American and Osage Indian artifacts and artwork, Civil War historical items, and many interactive exhibits that chronologically walk you through the development of the Ozarks. As you enter the museum, you dive right into American Indian culture, courtesy of an amazing collection of arrowheads – cases and cases of them. If you appreciate ancient culture, you’re sure to be impressed by the size and scope of the exhibits. The Terror Bird is one of the amazing displays that you can find inside the museum that resembles an ostrich, only much scarier. The bird stood more than eight feet tall, had a weight of 300 pounds and used its heavy beak to take down prey. As you explore the Ancient Ozarks Natural History Museum in Branson, you will learn about the people and animals that once roamed the region for more than 12,000 years. 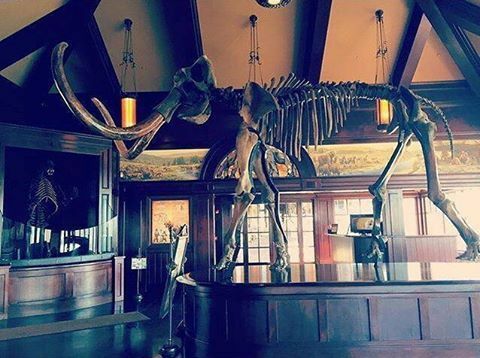 Many of the featured exhibits inside this fascinating Branson attraction include skeletal remains of a woolly mammoth, a saber tooth cat, a giant ground sloth, and prehistoric cave bears. Beautifully located at Top of the Rock, the museum offers on-site dining at Arnie’s Barn and Osage Restaurant, tours to the Lost Canyon Cave and Nature Trail, and play a round of golf at the Top of the Rock Golf Course. Your visit to the museum starts by hopping aboard an electric cart for an exhilarating two-and-a-half mile nature trail journey, overlooking Table Rock Lake. The tour begins at the Welcome Center of Top of the Rock Lost Canyon Cave and Nature Trail. You’re sure to enjoy the breathtaking natural beauty of the Ozarks. This Lost Canyon Cave and Nature Trail tour provides a one-of-a-kind nature park experience, where you will pass through covered Amish bridges, natural rock formations, waterfalls and caves. While you’re having a great time at the jaw-dropping, four-story, Top of the Rock Lost Canyon Cave, you can enjoy specialty drinks, like their signature John L’s Lemonade at its cave bar with a great view of cascading waterfalls. From here, you’ll enjoy the rest of your journey through the nature park and cave. This tour excursion at the Lost Canyon Cave and Nature Trail starts at 9 a.m. daily, with the last trip no later than one hour before sunset. There’s a Bat Bar in the area which opens at 11 a.m. to one hour before sunset. So, if you want to enjoy a fascinating vacation experience in Branson, visit the Ancient Ozarks Natural History Museum , one of Branson attractions that tells about the rich past of the Ozarks.